For Mark Quartiano, the catch of the day earlier this month was a tightly-packed kilo of cocaine. Quartiano, the top sport fisherman according to TripAdvisor in south Florida ("And around the world," he happily adds), was out with a couple of young Miami guys when they saw an unidentified yellow object about the size of a toaster oven floating in the Atlantic off the coast of Miami. Quartiano, who typically reels in sharks and not drugs, called the Coast Guard when he realized what he had. The Coast Guard came over and relieved Quartiano of the brick, which they pronounced to be pure, uncut cocaine, worth between $200,000 and half a million dollars on the street. "First we took pictures with it, of course," Quartiano says. "Then we let them take it away. All my friends thought that I was crazy for turning it in, but I'm not going to blow my reputation of 40 years on something like that." The south Florida waters are no stranger to large blocks of illicit substances. In fact, the term "square grouper" applies to large bales of marijuana tossed overboard by drug smugglers when they sense law enforcement closing in. Otherwise, it was just another day at the office for Quartiano, who has found himself in the crosshairs of People for the Ethical Treatment of Animals for much of his 40-year sport fishing career. "I've gotten death threats," he said in a telephone interview from about two miles due east of the Fontainebleau Hotel after another 85o Miami December day of fishing. "Apparently it's not okay for me to kill sharks, but it is okay for them to kill me. But I've got broad shoulders. I don't mind." Quartiano admits that he likes to bait PETA. "It's good for business," he laughs. "The angrier they get, the more people come my way." While the shark population off south Florida has diminished rapidly in recent years, Quartiano says that individual fisherman like him are hardly to blame. "Why don't they target the commercial fishing industry?" he asks. "They kill sharks by the metric ton every day. People like me take no more than a shark a day out of the waters." Maybe PETA's ire has something to do with Quartiano's admittedly politically incorrect website. It says, "We DON'T fly release flags upside down on our riggers, but we DO hang fish upside down on our gallows!" 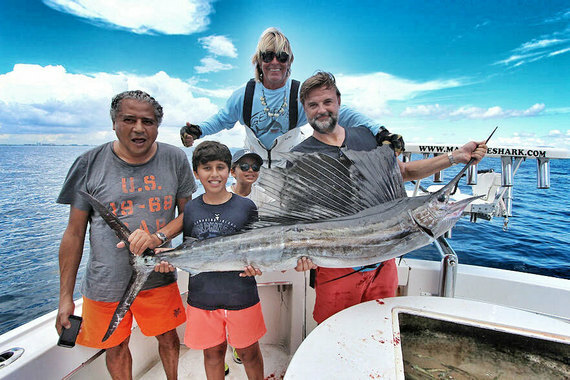 Miami visitors who check out TripAdvisor quickly discover that Quartiano is the top-ranked fishing experience in the region, boasting 269 reviews, of which 241 are five stars. "A real couple of characters who treated us like long lost family," one British contributor offered. "Mark and his crew were awesome, cool guys," said another. "Most fishermen down here have quit fishing for shark," Quartiano says. "I really don't have a lot of competition in that regard. Fishing for sharks is hard. The other guys don't have the boat I have, the fighting chair, the equipment, or the patience to try to catch sharks. They'd rather just take people out and have an easy day of it, but I'm the last shark guy standing." Quartiano claims to have caught nearly 100,000 sharks in 40 years and counts Will Smith, Robert DeNiro, and Shaquille O'Neal as repeat customers. PETA finds outrageous the idea that animals are used for food and says as much on its website. "That's just called fishing," Quartiano says. "We use 20 to 30-pound pieces of fish as bait. Again, if PETA is really that upset about shark fishing, why don't they go after the big guys? "Shark meat is delicious," Quartiano says. "Typically our clients take home what they catch, and they eat it. In Asia, shark fin soup is a huge delicacy, but the whole of the shark is great to eat. I know I'm asking for trouble by advertising myself the way I do, but it's just business. If you want to be vegan, that's your business. If you want to catch sharks, that's mine."